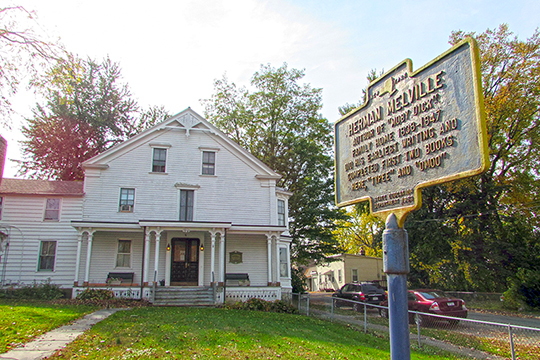 Photo: Herman Melville House, ca. 1786, #2 114th Street, Trpy, NY. Listed on the National Register of Historic Places, in 1992. Photographed by User:Midnightdreary (own work), 2014, [cc-by-4.0 (creativecommons.org/licenses/by-sa/4.0/deed.en)], via Wikimedia Commons, accessed March, 2018. Rensselaer County Courthouse is located at 1600 7th Avenue, Troy, New York 12180; phone: 518-270-2900. Rensselaer County sends public school students to 12 different school districts: Averill Park Central, Berlin Central, Brunswick Central, East Greenbush Central, Hoosic Valley Central, Hoosick Falls Central, Lansingburgh Central, North Greenbush Common, Rensselaer City, Schodack Central, Troy City, Wynantskill Union. This county was formed from Albany, Feb. 7,1791, and named from the Rensselaer family. It is centrally distant 12 mi. from Albany, and contains an area of 690 sq. mi. Its surface is very broken and hilly. Two distinct ranges of mountains extend through it N. and S., known as the Taghkanick and Petersburgh Mts. The Taghkanick Range occupies the extreme E. borders of the county, and is divided from the Petersburgh Mts. by the long, deep valley through which flow Kinderhook Creek and Little Hoosick and Hoosick Rivers. These mountains are wild, rugged, and rocky, rising to a height of 1000 to 2000 feet above tide, and affording wild and picturesque scenery.